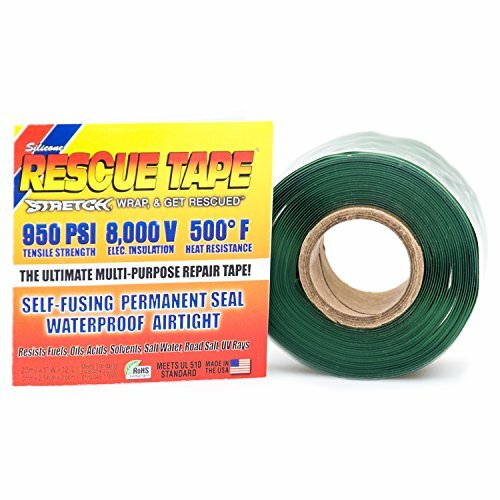 FIX ANY LEAK IN SECONDS: Shower, Garden, Kitchen, Boat - practically any leak can be fixed with Rescue tape in a matter of seconds. Rescue tape can be applied on any kind of surface and WE Guarantee it will never become gummy, sticky or unravel itself. Once it is properly applied it can serve as a permanent fix. ALWAYS WITH YOU WHEN YOU GET STUCK: Most people carry Rescue tape in their Emergency bag, car or on a boat for unexpected emergencies. Broken radiator hose or hot pipe is easy to fix with Rescue tape because it can handle temperature up to 500F and pressure up to 950 PSI. NO MORE RUSTY CONNECTIONS AND WIRES: Rescue tape is an Excellent insulant. It creates Insulation up to 8000 Volts per layer. You can safely put your christmas lights out, protect your antennas against UV light and corrosion or simply protect wires agains harsh conditions and salt water. If you have any questions about this product by Rescue Tape, contact us by completing and submitting the form below. If you are looking for a specif part number, please include it with your message.